Piscataway Township /pɪˈskætəweɪ/ is a township in Middlesex County, New Jersey, United States. As of the 2010 United States Census, the township's population was 56,044, reflecting an increase of 5,562 (+11.0%) from the 50,482 counted in the 2000 Census, which had in turn increased by 3,393 (+7.2%) from the 47,089 counted in the 1990 Census. The name Piscataway may stem from the area's original Native American residents, transplants from near the Piscataqua River defining the coastal border between New Hampshire and Maine, whose name derives from peske (branch) and tegwe (tidal river), or alternatively from pisgeu (meaning "dark night") and awa ("Place of") or from a Lenape language word meaning "Great Deer". The area was first settled in 1666 by Quakers and Baptists who had left the Puritan colony in New Hampshire. Society Hill (with a 2010 Census population of 3,829) is a census-designated place and unincorporated community located within Piscataway Township. Piscataway has advanced educational and research facilities due to the presence of Rutgers University, whose main campus spills into the township. High Point Solutions Stadium, home field for the Rutgers Scarlet Knights football team, is in Piscataway. Part of the Robert Wood Johnson Medical School is located in Piscataway as well. In 2008, Money magazine ranked Piscataway 23rd out of the top 100 places to live in America. In 2014, Money magazine ranked Piscataway 27th out of top 50 places to live in America. In 1666, the first appointed Governor of New Jersey, Philip Carteret, granted 12 new settlers from Massachusetts a 100 square mile lot of land that was later founded as the townships of Woodbridge and Piscataway. After this original purchase, additional settlers from the Piscataqua River area of New Hampshire also moved to the area. Coming from a lumbering, shipbuilding and fishing background, these settlers, consisting of mostly Baptists and Quakers, were comfortable with their new surroundings, and looking forward to starting a new life away from political and religious persecution in the north. They were also enterprising and pioneering families who were already experienced in wilderness settlement. Before the original settlers, there were pioneer scouts who surveyed theses new lands and waterways. The town name of Piscataway came from these early pioneers who originally came from the town of Piscataqua. During the original land purchase, the pioneers had signed 12 Articles of Agreement with Governor Carteret, which served as the legal basis for the government of Piscataway and Woodbridge and which shaped the democratic development of self-government. In short, these articles were mainly designed to provide liberty and land ownership for new families and to allow them to establish their own government representatives and religious freedoms. After a few line and boundary changes, Piscataway and its out plantations were reported to total 40,000 acres, with 66 square miles of land in 1685. The Lenni Lenape Indians were natives to the entire Piscataway area, but were quietly displaced to smaller areas as settler numbers increased. The Indians had established defined trails that the settlers used to travel through the wilderness area and branch out to new lands. Over time, many of these primitive trails became the main routes of travel from town to town and still exist today. The trails along the Raritan River were named after a local Indian tribe called the Raritangs. Piscataway Township is one of the fifth oldest towns in New Jersey and among the fifty oldest towns in the United States. Piscataway Township is located at 40°32′44″N 74°27′39″W﻿ / ﻿40.54564, -74.460817 (40.54564,-74.460817). According to the United States Census Bureau, the township had a total area of 19.029 square miles (49.286 km2), of which, 18.835 square miles (48.782 km2) of it is land and 0.194 square miles (0.504 km2) of it (1.02%) is water. The township lies on the south side of the Raritan Valley, a line of cities in Central Jersey, along with New Brunswick, Highland Park and South Plainfield. Piscataway lies 45 minutes southwest of New York City and 53 minutes northeast of Philadelphia. Piscataway is bordered by nine municipalities in Middlesex County, Union County, and Somerset County. The township consists of the communities of New Market (known as Quibbletown in the 18th Century), Randolphville, Fieldville and North Stelton. The original village settlement of Piscatawaytown is located in present day Edison Township. Piscataway is often segmented into unofficial sections by local residents which include Bound Brook Heights ("the Heights"), New Brunswick Highlands, Lake Nelson, Randolphville, Arbor, New Market, North Stelton, Fellowship Farm and Possumtown. As of the 2010 United States Census, there were 56,044 people, 17,050 households, and 12,958 families residing in the township. The population density was 2,975.5 inhabitants per square mile (1,148.8 /km2). There were 17,777 housing units at an average density of 943.8 per square mile (364.4 /km2). The racial makeup of the township was 38.46% (21,554) White, 20.69% (11,596) African American, 0.31% (173) Native American, 33.45% (18,744) Asian, 0.02% (13) Pacific Islander, 3.59% (2,011) from other races, and 3.48% (1,953) from two or more races. Hispanic or Latino of any race were 11.22% (6,289) of the population. There were 17,050 households out of which 35.0% had children under the age of 18 living with them, 59.9% were married couples living together, 11.7% had a female householder with no husband present, and 24.0% were non-families. 18.6% of all households were made up of individuals and 5.6% had someone living alone who was 65 years of age or older. The average household size was 2.91 and the average family size was 3.33. In the township the population was spread out with 20.1% under the age of 18, 17.8% from 18 to 24, 28.3% from 25 to 44, 24.1% from 45 to 64, and 9.7% who were 65 years of age or older. The median age was 33.0 years. For every 100 females there were 99.2 males. For every 100 females age 18 and over, there were 96.8 males. In the township the population was spread out with 21.9% under the age of 18, 14.1% from 18 to 24, 33.3% from 25 to 44, 22.1% from 45 to 64, and 8.7% who were 65 years of age or older. The median age was 33 years. For every 100 females there were 97.9 males. For every 100 females age 18 and over, there were 95.2 males. In November 1966, Piscataway voters, under the Faulkner Act, approved a Charter Study and elected a Charter Study Commission to recommend the form of Government best suited to the township's needs. The Commission recommended Mayor-Council Plan F. Voters approved the plan in a referendum in November 1967 and the new form of government was inaugurated on January 1, 1969. Under Plan F the Mayor is the administrator and the Council is the legislative body. A full-time business administrator, appointed by the Mayor with the advice and consent of the Council, and responsible to the Mayor, supervises the day-by-day operation of municipal government. There are seven Council members, one representing each of four wards, and three at-large members. Terms of office for the Mayor and Council members are four years, on a staggered schedule, with either the three at-large seats (and the mayoral seat) or the four ward seats up for vote in even years as part of the November general election. As of 2014, the mayor of Piscataway is Democrat Brian C. Wahler, whose term of office ends December 31, 2016. Members of the Township Council are Council President Michele Lombardi (D, 2014; Ward 4), Council Vice President Steven D. Cahn (D, 2014; Ward 3), Jim Bullard (D, 2014; Ward 2), Gabrielle Cahill (D, 2016; At Large), Michael Griffith (D, 2016; At Large), Mark Hardenburg (D, 2014; Ward 1) and Chanelle C. McCullum (D, 2016; At Large). 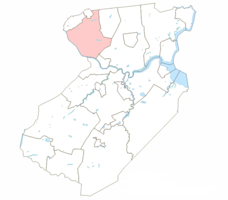 Piscataway Township is located in the 6th Congressional District and is part of New Jersey's 17th state legislative district. In the 2008 presidential election, Democrat Barack Obama received 71.0% of the vote here (15,978 cast), ahead of Republican John McCain with 27.2% (6,111 votes) and other candidates with 1.0% (215 votes), among the 22,491 ballots cast by the township's 32,398 registered voters, for a turnout of 69.4%. In the 2004 presidential election, Democrat John Kerry received 64.2% of the vote here (12,627 ballots cast), outpolling Republican George W. Bush with 34.3% (6,749 votes) and other candidates with 0.8% (218 votes), among the 19,670 ballots cast by the township's 27,842 registered voters, for a turnout percentage of 70.6. In the 2009 gubernatorial election, Democrat Jon Corzine received 54.9% of the vote here (6,773 ballots cast), ahead of Republican Chris Christie with 37.6% (4,637 votes), Independent Chris Daggett with 6.0% (738 votes) and other candidates with 0.9% (111 votes), among the 12,334 ballots cast by the township's 31,079 registered voters, yielding a 39.7% turnout. Fire and EMS Piscataway is divided into four fire districts which are served by a total of two volunteer rescue squads and six volunteer fire companies, one of which combines both fire and EMS services. The fire districts are the zones in which fire departments operate, and although the volunteer EMS squads follow the basic regions of the districts, only North Stelton Fire Rescue EMS is a part of a fire district. Additionally, on weekdays and weekends from 6am until 6pm, Robert Wood Johnson University Hospital staffs an ambulance in Piscataway. When the volunteer rescue squads are not in service, either Rutgers University Emergency Services or Robert Wood Johnson University Hospital may be asked to send an ambulance. The Piscataway Township Schools serves students in Kindergarten through twelfth grades with its high school, four schools that educate students in kindergarten through third grade, two intermediate schools serving grades 4–5, and three middle schools for students in grades six, seven, and eight. As of the 2011-12 school year, the district's 10 schools had an enrollment of 7,287 students and 516.2 classroom teachers (on an FTE basis), for a student–teacher ratio of 14.12:1. Schools in the district (with 2011-12 enrollment data from the National Center for Education Statistics) are the four elementary schools — Eisenhower Elementary School (grades K–3; 540 students), Grandview Elementary School (Pre-K–3; 730), Knollwood Elementary School (K–3; 499) and Randolphville Elementary School (K–3; 557) — both Arbor Intermediate School (556) and Martin Luther King Intermediate School (551) for grades 4 and 5, three middle schools for grades 6–8 — Conackamack Middle School (433), Quibbletown Middle School (579) and Theodore Schor Middle School (606) — and Piscataway Township High School with 2,236 students in grades 9–12. The township had a total of 206.70 miles (332.65 km) of roadways, of which 181.68 miles (292.39 km) are maintained by the municipality, 18.94 miles (30.48 km) by Middlesex County and 6.08 miles (9.78 km) by the New Jersey Department of Transportation. New Jersey Transit provides bus service to and from the Port Authority Bus Terminal in Midtown Manhattan on the 114 route, to Newark on the 65 and 66 routes, local service on the 819 line and additional service on the 980 route. Train service is not available Piscataway, but service is available on the Raritan Valley Line at the Dunellen station and on the Northeast Corridor at the Edison station. Yurcak Field is a multi-purpose soccer and lacrosse stadium, built in 1994, and holds 5,000 people. The stadium is officially named "The Soccer/Lacrosse Stadium at Yurcak Field" in honor of Ronald N. Yurcak, a 1965 All-American Rutgers lacrosse player. Rutgers University and Major League Lacrosse's New Jersey Pride both host their home games at this stadium. Louis Brown Athletic Center is the home of the Rutgers University men's and women's basketball teams. The venue was originally named the Rutgers Athletic Center, and is still referred to as the RAC by many, and can accommodate 9,000 attendees. High Point Solutions Stadium is a 52,454-seat statdium that opened in September 2011 as the home of the Rutgers Scarlet Knights football. team. Gorgias Press, an academic publisher that specializes on Eastern Christianity. George Kiraz is the president. Founded in 2001, it reprinted 12 rare works on Eastern Christianity and the Ancient Near East in its first year. The press moved to publishing new books while continuing to reprint academic books. As of 2010, its catalog contained about 2,500 titles. Pepsi Cola Bottling Group A Pepsi Cola bottling plant. Siemens Hearing Instruments, is the world’s largest manufacturer of hearing aids. Jeff Gardner (born 1968), attorney and politician. Malcolm Jenkins (born 1987), cornerback for the Ohio State Buckeyes, now a member of the New Orleans Saints. Isaac Low (1735-1791), member of the First Continental Congress in 1774 who opposed armed conflict with the British and left the American side after the signing of the Declaration of Independence. Nicholas Low (1739-1826), merchant and developer. Lisa Marie (born 1968), actress in Planet of the Apes and Sleepy Hollow. Matt Nagy (born 1978), quarterback coach for the Kansas City Chiefs who played in the Arena Football League. Karl Towns (born 1995), basketball player for St. Joseph High School who played for the Dominican Republic national basketball team. Eric Young, Jr. (born 1985), second baseman and outfielder who has played for the New York Mets. ^ 2013 New Jersey Mayors Directory, New Jersey Department of Community Affairs. Accessed November 24, 2013. As of date accessed, source incorrectly lists a term-end year of 2015. ^ Township Clerk, Township of Piscataway. Accessed October 3, 2012. ^ USGS GNIS: Township of Piscataway , Geographic Names Information System. Accessed March 11, 2013. ^ a b c Profile of General Demographic Characteristics: 2010 for Piscataway township, New Jersey Department of Labor and Workforce Development. Accessed October 2, 2012. ^ Table 7. Population for the Counties and Municipalities in New Jersey: 1990, 2000 and 2010, New Jersey Department of Labor and Workforce Development, February 2011. Accessed October 2, 2012. ^ a b Cheslow, Jerry. "If You're Thinking of Living in: Piscataway", The New York Times, June 28, 1992. Accessed October 3, 2012. "What is now the township was settled in 1666 by Quakers and Baptists fleeing the intolerant Puritan colony in New Hampshire. While Piscataway is a derivative of the Leni Lenape word for "Great Deer," the township is believed to have been named for the settlers' former home on the Piscataqua River." ^ Governors of New Jersey, New Jersey State Library. Accessed August 7, 2014. ^ [ New Jersey Localities], State of New Jersey. Accessed August 7, 2014. ^ About Middlesex County: What's in a Name, Middlesex County, New Jersey. Accessed November 24, 2013. "Quibbletown (Squabbletown) - Baptist Sects argued whether Saturday or Sunday is the Sabbath." ^ New Jersey Resident Population by Municipality: 1930 - 1990, Workforce New Jersey Public Information Network, backed up by the Internet Archive as of May 2, 2009. Accessed October 3, 2012. ^ a b c d e Census 2000 Profiles of Demographic / Social / Economic / Housing Characteristics for Piscataway township, New Jersey, United States Census Bureau. Accessed October 2, 2012. ^ Piscataway Township Government, Township of Piscataway. Accessed December 14, 2006. ^ Mayor and Township Council, Township of Piscataway. Accessed August 7, 2014. ^ 2013 Municipal Data Sheet, Township of Piscataway. Accessed November 24, 2013. ^ Staff. "UPDATED: Middlesex County, Long Hill Twp. general election results and Long Hill Township, Morris County", Courier News, November 7, 2012. Accessed November 24, 2013. ^ Staff. "Piscataway election results", Courier News, November 2, 2010. Accessed November 24, 2013. "Three incumbents, including 20-year Councilman Mark Hardenburg, swept to victory Tuesday along with one newcomer to keep Democrats completely in control of the seven-member Township Council." ^ November 5, 2013 General Election Unofficial Results, Middlesex County, New Jersey, updated November 12, 2013. Accessed November 24, 2013. ^ Piscataway's Fire Districts. Accessed August 7, 2014. ^ Fire Companies and Rescue Squads, Township of Piscataway. Accessed August 7, 2014. ^ History, New Market Fire Company. Accessed August 7, 2014. ^ History, Holmes Marshall Volunteer Fire Company. Accessed August 7, 2014. ^ Fire Prevention Bureau, Piscataway, New Jersey. Accessed August 7, 2014. ^ Police Department, Piscataway, New Jersey. Accessed August 7, 2014. ^ District information for Piscataway Township School District, National Center for Education Statistics. Accessed August 7, 2014. ^ School Data for the Piscataway Township Schools, National Center for Education Statistics. Accessed August 7, 2014. ^ Eisenhower Elementary School, Piscataway Township Schools. Accessed November 24, 2013. ^ Grandview Elementary School, Piscataway Township Schools. Accessed November 24, 2013. ^ Knollwood Elementary School, Piscataway Township Schools. Accessed November 24, 2013. ^ Randolphville Elementary School, Piscataway Township Schools. Accessed November 24, 2013. ^ Arbor Intermediate School, Piscataway Township Schools. Accessed November 24, 2013. ^ Martin Luther King Intermediate School, Piscataway Township Schools. Accessed November 24, 2013. ^ Conackamack Middle School, Piscataway Township Schools. Accessed November 24, 2013. ^ Quibbletown Middle School, Piscataway Township Schools. Accessed November 24, 2013. ^ Theodore Schor Middle School, Piscataway Township Schools. Accessed November 24, 2013. ^ Piscataway Township High School, Piscataway Township Schools. Accessed November 24, 2013. ^ Schools, Piscataway Township Schools. Accessed November 24, 2013. ^ New Jersey School Directory for the Piscataway Township Schools, New Jersey Department of Education. Accessed November 24, 2013. ^ About Lake Nelson, Lake Nelson Seventh Day Adventist School. Accessed August 7, 2014. ^ About, An-Noor Academy. Accessed August 7, 2014. "An-Noor Academy & Darul-Huda Institute was established in September 2000 by Muslim Center of Middlesex County (MCMC) to serve the educational needs of the Muslim community of Piscataway and surrounding areas." ^ Piscataway, NJ Campus, StenoTech Career Institute. Accessed August 7, 2014. ^ Middlesex County Bus / Rail Connections, New Jersey Transit, backed up by the Internet Archive as of May 22, 2009. Accessed October 2, 2012. ^ Staff. "Uncle Sam’s House: Anarchy in Piscataway", Weird New Jersey. Accessed August 7, 2014. ^ High Point Solutions Stadium - The Home of the Scarlet Knights, Rutgers Scarlet Knights football. Accessed August 7, 2014. ^ Historic Sites, Piscataway, New Jersey. Accessed August 7, 2014. ^ Cornelius Low House / Middlesex County Museum, Middlesex County Cultural and Heritage Commission. Accessed November 24, 2013. "Cornelius Low was a leading citizen of Raritan Landing, a port community on the Raritan River in central New Jersey that flourished between 1720 and 1835." ^ Massing, Dana. "Moosa tackles centuries-old issue; Professor examines Crusades, conflict between Christians and Muslims", Erie Times-News, August 23, 2008. Accessed August 7, 2014. ^ Hapag-Lloyd America Inc., Hapag-Lloyd. Accessed February 22, 2008. ^ Mike Alexander, database Football. Accessed November 24, 2007. ^ Proceedings of the New Jersey Historical Society, p. 112. New Jersey Historical Society, 1906Accessed November 24, 2013. "Edward Antill, a New York Merchant of the seventeenth century, and His Descendants: Particularly, Edward Antill 2d of Piscataway, N. J. ; Lieutenant Colonel Edward Antill 3rd, of Quebec and Montreal"
^ About Melissa, Melissa Bacelar. Accessed November 24, 2013. "Melissa grew up in Piscataway, New Jersey. Her father came to America from Cuba when he was thirteen and her mother's family owns the oldest Lumber Yard in New Jersey, opened by her great grandfather in the 1900's." ^ Inventor Profile: Samuel Blum, National Inventors Hall of Fame. Accessed November 24, 2013. "Born in New York, Blum spent most of his school years in Piscataway, New Jersey before attending Rutgers University." ^ Blue Jersey, database Politics. Accessed June 8, 2010. ^ J. D. Griggs, Akron Zips football. Accessed November 24, 2013. ^ Cast, Anyone But Me. accessed November 24, 2013. "RACHAEL HIP-FLORES (Vivian) was born and raised in Piscataway, NJ and graduated Mason Gross School of the Arts at Rutgers University." ^ Asjha Jones profile, Women's National Basketball Association. Accessed September 6, 2007. "A Parade, USA Today and Street & Smith First Team All-American at Piscataway High School, averaging 22.2 points, 11.1 rebounds, 3.6 assists, 2.5 blocks and 2.9 steals…Scored a school career-record 2,266 points and had 1,256 rebounds." ^ Lizura, Joe. Medieval Church Discovered, Joe Lizura Official Website, September 6, 2012. Accessed November 24, 2013. "At least I personally have a good feeling for ”old” because my hometown of Piscataway, New Jersey was founded in 1666 – old? yes, but still not as old as the Church under the parking lot in England." ^ Finding aid for Nicholas Low Collection, 1776-1863, William L. Clements Library of the University of Michigan. Accessed November 24, 2013. "Nicholas Low was born in Raritan Landing, New Jersey, on March 30, 1739, the son of Cornelius Low, Jr., and Johanna Gouverneur." ^ Lee, Linda. "A NIGHT OUT WITH: Lisa Marie; A Vargas Girl in the City", The New York Times, July 29, 2001. Accessed October 1, 2007. "She was raised in Piscataway, N.J., and came to the city in her teens to study dance." ^ Haley, John. "Karl Towns of St. Joseph-Metuchen selected Gatorade State Player of the Year", The Star-Ledger, March 21, 2013. Accessed November 24, 2013. "Well, that’s what people saw when Karl Towns, a sophomore at St. Joseph in Metuchen, found out he was chosen as the 2013 New Jersey Gatorade Player of the Year on Thursday morning. 'Someone said they saw it on twitter,' said Towns, a Piscataway resident, taking a break from lunch." This page uses content from the English language Wikipedia. The original content was at Piscataway, New Jersey. The list of authors can be seen in the page history. As with this Familypedia wiki, the content of Wikipedia is available under the Creative Commons License.